This week I was really excited, because we were going to Artpark in Lewiston to see Garbage and Blondie on the Rage and Rapture tour. I had first seen Garbage open for U2 on the Elevation tour in October 2001 (which is one of my top 5 concerts ever), and they were so impressive, I’ve been waiting all these years to see them again. I love Shirley Manson, I wouldn’t mind being her! And Blondie, she’s a legend, and while I may not be familiar with her catalog, her big songs are inescapable. Lewiston’s Center Street is full of little shops and restaurants, including several new ones. Before (and after) the concert we stopped into the new Brickyard Brewing Company, next door to the original Brickyard restaurant. The restaurant is a BBQ restaurant, but the brewery has a completely different menu of gastropub style foods. We tried the fried gnoche (excellent! ), fried green tomatoes, shrimp po boy, a fancy grilled cheese sandwich, and on our return visit, the bacon nan. Everything was delicious, and they offer a chicken and waffle dish that I must try at some point, I just wasn’t hungry enough for it that day. We tasted 9 of their beers, and were happy with all of them. Upon walking back to my car to head home, I realized I was parked across the street from Cask and Cow, a new restaurant that I had “liked” on facebook, but had no idea where it was located. It is so new, it was actually their first day open! By this point it was midnight, so the kitchen was closed, but we relaxed at the bar with a few drinks. J gave his usual spiel, asking the bartender Sarah (spelled wrong!!! No Hs needed! 🙂 ) if she could make me a bloody. This got her nervous and she almost didn’t want to do it! Served in a pint glass rimmed with smoked paprika and kosher salt, the drink was garnished with lemon, lime and 3 olives. Sarah won points by asking if I preferred Tabasco or Frank’s Hot Sauce, since I never want Frank’s! 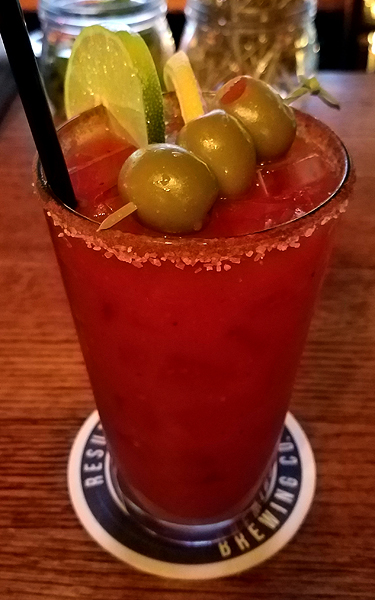 It was very spicy, with a strong tomato flavor, and it was a good classic Bloody Mary. After a few sips Sarah (god it’s so hard to type it that way!) realized she forgot her secret ingredient!! So she took it back! Oh no she forgot the secret ingredient! She added her secret and asked what I thought before she told what it was. It didn’t change it with any strong flavor, like say pickle juice or horseradish would, but it definitely cut the strength of the tomato flavor. What was the secret? A splash of pineapple juice. 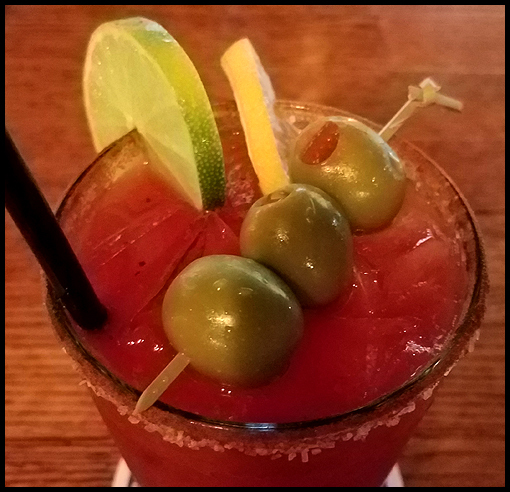 After knowing what it was, I could detect a slight sweetness to the drink, and the cut in the acidity of the tomato created a good balance of flavors. We don’t get out to Lewiston too much, even though it’s not far away, but we’ll have to go back soon to try the menu at Cask and Cow, as well as the chicken and waffles at Brickyard Brewery. And the show?!? It was great! We were too far away for me to get really excited and into it, but Garbage looked and sounded great, and Blondie, at 72 years old (!!) still rocked it. It was my first time for an outdoor concert at Artpark (I graduated high school in the auditorium, as well as seeing concerts and plays inside, and selling my art at ARTsPARKed) and it was a great space, like a natural ampitheatre. I’d definitely go again for a band I want to see. 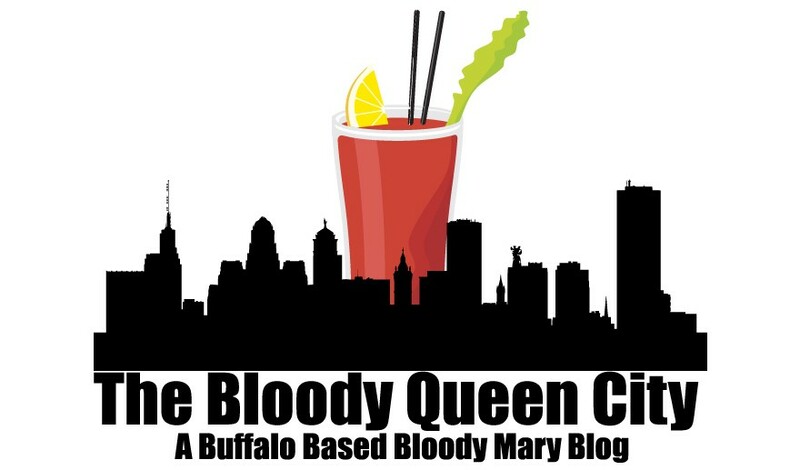 *update* Cask and Cow is now featuring a fancy Bloody Mary with a slider garnish. Guess that means I’ll have to go back!